I'm currently watching this anime series and sometimes doing a marathon as I am only half of the total currently aired episodes. I've been watching this years ago because this was aired on one of the cable channels in my home back then. I love detective stories and mysteries; it makes my brain work out and think through things and discover stuff that I've never thought that could be possible. In a nutshell: Detective Conan is an anime(and manga) series by Gosho Aoyama that started in 1996 and is still running. It's about Shinichi Kudo, a young detective, who was drugged by The Black Organization when he sees them blackmail a director for a huge amount of money. Shinichi then turned from a 17-year-old teenager to a 7-year-old kid when he was given the drug. And so, as he finds The Black Organization, solves cases along the way and meets new friends and people who might or might not be associated with the organization. 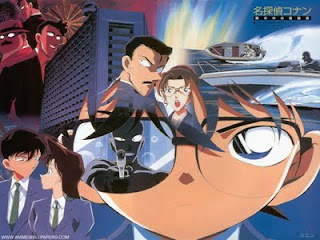 At the same time, he protects his identity from his childhood friend, Ran Mouri, a Karate champion, who lives with her father, Kogoro Mouri who is also a detective. 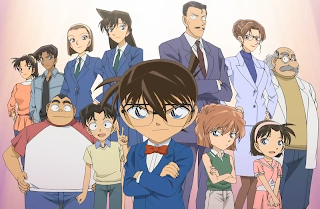 Shinichi named himself Conan Edogawa as a kid and lived with the Mouris to keep a close eye on Ran(though he won't admit it), solve cases by giving Mouri the credits, and searching for the Black Organization to turn himself back to his old body. Like I said, this series is still ongoing. The mangaka releases the chapters, the new episodes are being shown, movies are still being produced (the 13th movie has just been recently showed), and OVAs and specials that some don't really take notice of. I know I said before that I don't tell stories; but when I make recaps, I'll make an exception as this is something that I've always wanted to try, so please pardon me when I release my first recap as I am just starting. But before I do that, let me just introduce the main characters in the story, and I'll introduce some of them as well as I do the recaps. Shinichi Kudo is a famous 17-year-old detective, the son of Yusaku Kudo, who is an author of detective stories. He is very well-known in Japan and internationally, and he can also solve cases as good as Shinichi. His wife and Shinichi's mother, Yukiko Kudo, is a former actress who married young against her family's will. She appears occasionally in the series which sometimes annoys Shinichi because of her childishness although she helps him with the cases. The couple is currently in Los Angeles, leaving Shinichi behind by himself, but they are updated on what happened to their son, thus Yukiko showing up to keep track of his whereabouts. When she does visit though, she says that Conan is her nephew. Kogoro Mouri, a former police officer and now an incompetent detective, and who also despises Shinichi for he can't get any client because of him. But when Conan showed up in his doorstep and solves the cases for him, he became well-known as 'The Sleeping Kogoro'. He loves drinking and the singer Yoko Okino. He's irresponsible, but he loves Ran and sometimes Conan lets him solve the cases when he has a better judgment. He has been separated for 10 years with Eri Kisaki, a big-time lawyer in Japan, who somewhat still loves him for she still wears her wedding ring. Their daughter, Ran Mouri, is Shinichi's childhood friend. Sometimes she can be a tomboy, what with her karate skills that scares Shinichi, but she's afraid of ghosts and she sleeps very deeply, a habit that has once put her almost in danger. She's the opposite of her father, for she takes care of him and Conan most of the time. Conan Edogawa is the name Shinichi used when he turned into a kid. He solves most of the cases and will continue doing so, until he meets with the Black Organization. He claims that he's Professor Hiroshi Agasa's nephew, a professor who loves making new inventions and devices that sometimes help Conan. He lives next door to the Kudos and he's one of the few people who knows Shinichi's secret. Alright, so they're pretty much the main characters in the anime, and as the series moves along, so does the introduction of the new characters, which will be shown in the recaps. So please bear with me here. Hello! Welcome to Lora's Homecoming. I write about my life and Korean and Japanese dramas.